Rangana Herath produced a great spell of 6/43 in the second innings of the 1st Test played at Abu Dhabi for Sri Lanka to get a 21 run win and take a 1-0 lead in the series. 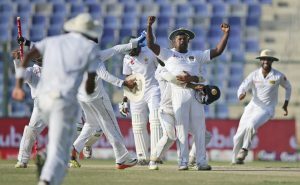 Herath became the first bowler in Test history to take 100 wickets in Tests vs Pakistan and the second Sri Lankan to go past 400 wickets in Tests while he is only the second left-arm bowler in Test history to take 400 wickets. Pakistan were set a target of 136 runs to chase in final two sessions of Day 5 but were bowled out for 114 in the fourth innings with Herath picking up 6 wickets for 45 runs. Dilruwan Perera took three wickets for 46 runs.